Actuaries access a lot of data, across many devices. As many as 5000 different device configurations including browsers. 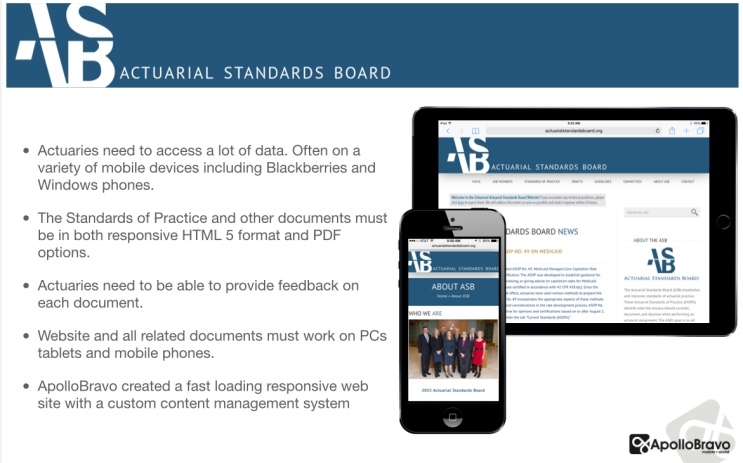 ApolloBravo created a fully responsive HTML 5 website with a customized content management system allowing actuaries to access and comment on important standards of practice, accessible in HTML 5 format or downloadable as PDF’s. Are you looking for a web based solution for large amounts of data that needs to be easily accessible on mobile devices? Contact us for a free mobile readiness consultation. Visit site.